Pineapple is rich in bromelain, an enzyme that reduces inflammation, in addition to vitamins A, B, C, and a load of minerals. Papaya is rich in vitamin A (that’s how it gets its orange color), vitamin C, and calcium for gently removing dead skin cells. This isn’t a scrub but a nourishing mask that will leave your skin tropically soft. Mash the fruits together until in a pulp. Add the other ingredients and combine well. Apply mixture to skin and leave on for a few minutes. Rinse with warm water and press skin with a warm washcloth. Add some tequila and this could become your summer drink of choice! Strawberries are a natural source of salicylic acid, which is used to treat hardened skin (warts, callouses) due to its anti-inflammatory and pore-opening qualities. Unlike the preparations you buy at the pharmacy, however, strawberries are much milder and gentler. Vitamin C adds antioxidant properties. And it smells yummy. Salt is a natural exfoliant and helps stimulate skin to remove toxins. Almond oil’s fatty acids hydrate and firm the skin, leaving a protective barrier. Add strawberries to blender or food processor and pulse several times to break up the berries (broken, not puréed). Remove to glass bowl. Stir in lime juice and almond oil. Mix in salt. Smoothe over clean, damp skin and work in small circular motions. Leave mixture on for a few minutes. Rinse face with water and pat dry. Extra scrub can be stored in the refrigerator in an airtight container for 7-10 days. Baking soda is a mild abrasive, good not only for cleaning and deodorizing throughout your home but gently removing crud from your face. Nourishing coconut oil adds vitamins and a natural sunscreen, lemon a mild astringent and toner. Smells like a tropical drink for seaside enjoyment so the aroma will help to brighten your day. Mix all ingredients together and place in an air tight glass container (use baking soda if you have sensitive or dry skin). 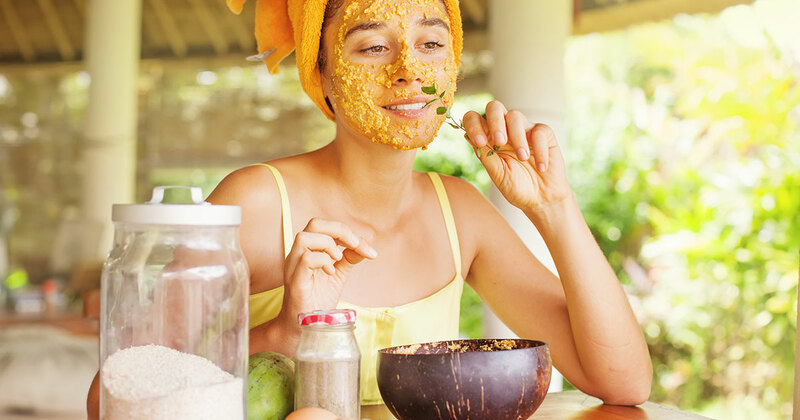 To make this a body scrub, replace sugar with sea salt or Epsom salts.